I got off the Arroyo Secco at one of the Avenues in Highland Park and headed north on Figueroa. 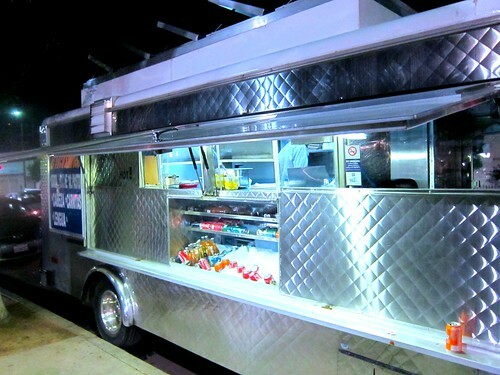 The plan was to sweep through Highland Park and eat at any trucks that I’ve missed, and any new ones that have popped up. 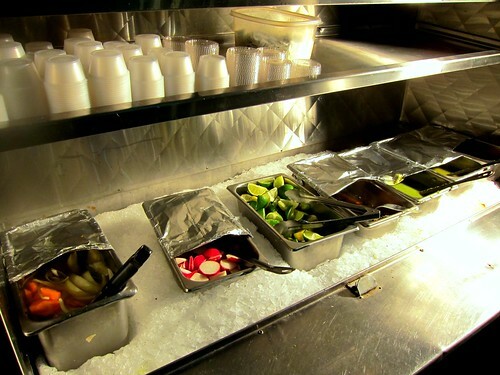 The best tacos in Highland Park are probably from the outlaw taco tables that set up on side streets and in front of businesses. Some set up in front of homes. 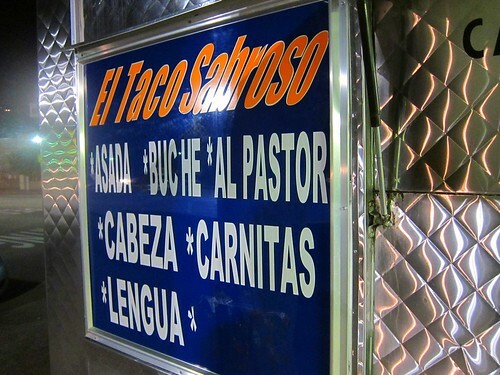 Those would have to wait, for at the moment I am still on my quest to blog about every taco truck in LA. I ordered carne asada and al pastor. 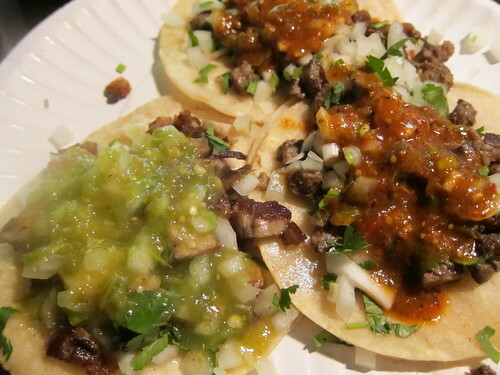 The tacos came topped with a nicely spiced salsa roja. I liked the beef; it was a little greasy,had no fatty bits, and had some nice flavor. The pork tasted like carnitas, but it had a little achiote spice to it, so it was clearly El Sabroso’s al pastor offering. 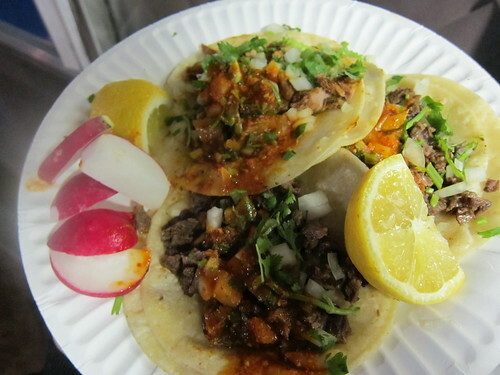 It’s not unusual to find this kind of al pastor at taco trucks in Highland Park. La Estrella and El Pique have set the standard for this style and since they are the two most popular trucks in the area, al . You either love it or you hate it. It’s not traditional al pastor, but it does have good flavor. The tortillas could have used a little more grill time and a little oil applied to them. 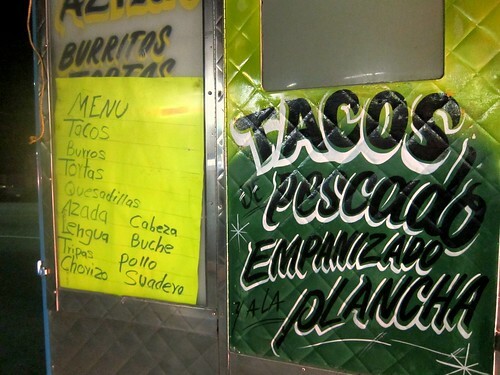 They were definitely the weakness of these tacos. I got back in my car and headed north again. 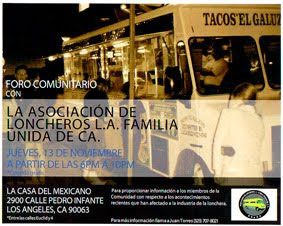 After a few blocks I saw a taco truck I had not seen before called Tacos Azteca. When I got up to the truck a family was waiting for a large order. The cook was the only one inside the truck and he was doing everything including taking orders and handling money. This isn’t usually a good sign. If a truck were doing good business there would be someone else taking orders and handling money. I ordered carne asada and suadero; they didn’t have al pastor. It took a little while but my tacos were cooked to order and had a greasy flavor to them. Both the suadero (beef rib) and carne asada were a little crispy. Neither salsa had much heat, but the salsa verde had good flavor. Overall just average tacos. I got back into my car, six tacos in, but still game. 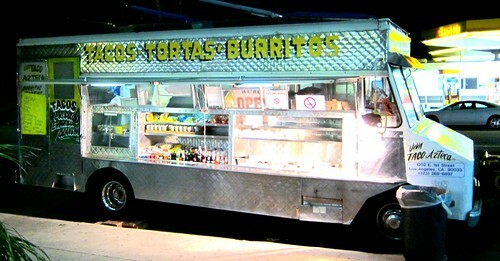 Maybe I should look for an outlaw taco cart I thought, but it was a week day, and the chances of finding any were low. So I got back on the Arroyo Secco and headed home. Takitaco seems to have disappeared -- I've gone to their old spot different nights over the past three weeks and not seen them. Even drove Figueroa from Ave 25 to Ave 60, and no sign. Any idea what happened to them? I haven't seen them the last 3 times I was in Highland Park. I hope they turn up. They are one of HP's better trucks.